Here at AYH we are fortunate to have the newest technology at our disposal in the form of the PiezoWave from German Medical experts Richard Wolf Industries. True Extracorporeal Shock Wave is considered a superior, more efficient form of Shock Wave. ESWT has been used successfully in the treatment of chronic pain since the early ’90s. ESWT & TPST are highly efficient, non-surgical treatments for chronic pain in the musculoskeletal system. The body’s healing process is accelerated by activating the body’s innate healing responses. 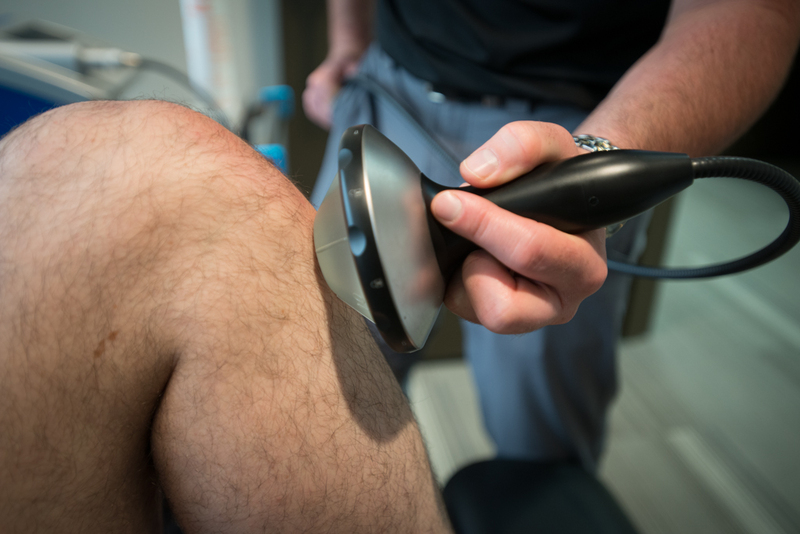 Aside from helping break down thickened, inflexible scar tissue, the shock waves stimulate new blood vessel formation (neovascularization) to the injured area leading to improved circulation and metabolic processes. Once this occurs the body will even begin to re-absorb irritative calcium deposits from the affected tendons. This forces the damaged tissues to progressively regenerate, eventually healing properly. At the applicator head exact depth of penetration can be varied by use of varied thickness gel pads. The large emitter of the applicator head allows for focused energy at a set depth, NOT at the skin layers where a patient would sense unnecessary treatment pain. The Intensity of the impulses can be varied greatly over a 20 point scale, thus allowing both high levels of treatment efficiency while maintaining patient treatment comfort without freezing or sedation. Benefits of ESWT are often experienced after only 3 to 5 treatments with some patients reporting immediate relief after the treatment. In some difficult cases it can take approximately 4 weeks to see the desired pain relief to begin, then between 9 to 12 weeks to resolve. Scientific studies have shown the most significant tissue healing occurs in the 6 – 9 week window. The effects of the treatment are accumulative, so even after the last treatment is performed benefits will continue to appear for weeks afterward as the treated tissues heal. This procedure aims to eliminate pain, regain normal range of motion/mobility, subsequently restoring exercise tolerance and quality of life. After a thorough history and physical examination is performed to identifiy the pain region(s), a small amount of ultrasound gel is applied to the skin over the area. Then the Piezowave treatment head will be place on the region to generate the shock waves. After a few test impulses to best isolate the exact “spot”, the applicator will be focused there for the duration of that point’s treatment at a frequency and intensity comfortably tolerable to the patient. NOTE: There is no contra-indication to being concurrently treated with other modalities to expedite patient results. Sports medicine examples could include a patient using Active Release Techniques® or Graston® to treat the scar tissue of a case of Tennis Elbow, Shockwave to isolate the difficult root to the problem, and Acupuncture to moderate the pain and further enhance the body’s healing response.